In a previous post, I talked a little bit about how fear can stop you from pursuing your writing goals. 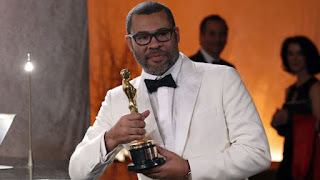 Since then, Jordan Peele, originally known for his work in sketch comedy, won the Oscar for best original screenplay for his movie Get Out. Winning this award is of course historically important. Among other things, it is the first time the award has gone to an African-American. It is also the first time Peele had directed any movie, much less a movie he himself had written. He kept going. He worked though his resistance with the material, frustrations with getting the movie made, and a hundred other blocks, both internal and external, to complete the script and shoot the film. Now, there are lots of stories out there that never get the audience they deserve. However, an important take-away from the story of the making of Get Out is no matter how improbable it all seems, follow through and finish your story. You never know where that light you bring into the world will shine.